In today’s modern society, it can be quick and convenient to look up a local cleaning company to sanitize and maintain your property. Searching for professional floor cleaning services can return a lot of results, but unfortunately, many of these outfits are not up to the task of consistently cleaning and maintaining your facility with proven services and a keen focus on delivering the best outcome. Crystal Clear Enterprise is proud to be your top source for the best carpet cleaning services in Kansas City. For more than 20 years, our professional janitors have worked to optimize our processes to deliver a shiny outcome for your building that also helps to save money and streamline maintenance operations. Our dedication to professional carpet cleaning and textile services helps us to build a reputation of delivering consistently high-quality and reliable services. We are now also certified with the Institute of Inspection Cleaning and Restoration Certification (IICRC). This non-profit institution strives to set the standard for cleaning services in more than 25 countries, and our janitorial company now has the accreditation to back up our years of service. If you are in need of professional cleaning services, read on to learn about the benefits of working with an IICRC-certified commercial cleaning company. Anyone can boast about their rigorous training for janitorial services, but few can provide certifiable proof that they surpass the industry standards. IICRC certification is useful for documenting and proving that our cleaning company is providing the best personnel and services for your facility. The Crystal Clear team relies on the most modern technology and stringent training standards to create a team that is as reliable as it is experienced. The IICRC requires continuing education as a part of their certification program, and technicians must be updated with the latest changes in the industry. From our Automated Management System (AMS) to the most modern techniques, Crystal Clear is here to provide a consistent level of quality with each of our highly trained employees, and our new certification is here to give you peace of mind. When it comes to property management, safety should always be the top priority – no exceptions. The IICRC focuses on safety first and foremost in all operations, requiring janitorial companies to maintain a high standard for all of their cleaning services. Every hazardous aspect of our carpet cleaning services must be addressed properly in accordance with industry standards to create a healthy environment for your employees and guests. You can focus on other aspects of your facility and leave the cleaning concerns to our experienced team. Each Crystal Clear team member is trained to find and address any potential safety hazards, ensuring that your building is safe at all times. One of the biggest fears that many property managers have when hiring a commercial cleaning company is that their janitorial needs will not be fully addressed. That cleaning company that offered you a great price may be able to vacuum your floors and sanitize surfaces, yet they will be unable to assist if any repairs or major challenges arise. Our professional cleaners are able to provide a wide range of specialty services such as yard work, painting, pest control, and more. Our comprehensive list of cleaning services is backed up by our IICRC certification, making us your all-in-one source for property management services. You can rest assured that your facility will be taken care of to the best of our ability with facility sanitizing and carpet cleaning services that are as thorough as they are reliable. Working to achieve the high standard set forth by the IICRC enables Crystal Clear Enterprise to form working relationships with a wide range of professionals in the industry. As an IICRC-certified commercial cleaning company, we have access to information and support from a wide range of manufacturers of cleaning products, fabrics, furnishings, and more. This advantage helps us to provide even more thorough cleaning services without the high stress and costs of figuring it out with professional help. The IICRC holds a lot of weight in this industry, and hiring a cleaning company with this certification ensures that you are receiving the best outcome in regards to maintenance standards and warranty requirements. Building a foundation of trust is important in any professional relationship, which is why Crystal Clear Enterprise is dedicated to forming quality relationships with all of our clients. 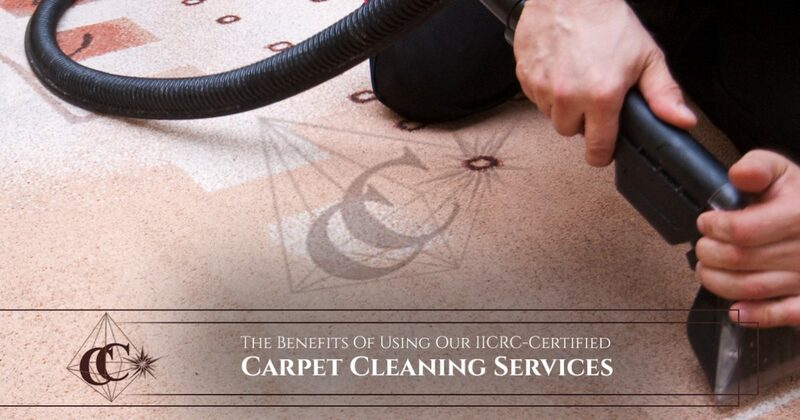 Our IICRC certification is a landmark measure of our dedication to industry standards, delivering the best carpet cleaning services to Kansas City businesses. Contact us today to learn more!